As China’s oldest members of Generation Z (1998-2016) turn 21 this year, the urgency to market to them is mounting, and both brands and retailers need to understand how this generation is different from previous ones. Also of importance? Recognizing how China’s Gen-Z differs from its peers in other parts of the world. Their consumption power can’t be ignored: China’s Gen-Z spends 15 percent of a household’s income, the highest proportion of any country. In contrast, their peers in Western countries such as France (5 percent), the United Kingdom (4 percent) and the U.S. (4 percent) spend much less comparatively. This finding comes from the recent Gen-Z report, “A Generation Without Borders,” which was published on January 24th by the global strategy consulting firm OC&C in partnership with data provider Viga. The report is based on interviews with 15,500 respondents from nine countries including Brazil, China, France, Germany, Italy, Poland, Turkey, the U.K., and the U.S., as well as panel discussions with Gen-Z members aged 16 to 21 in the U.K., U.S., and China. Compared to their global peers, Chinese Gen-Zs save less: 75 percent of them are saving money compared to 85 percent of Gen-Zs globally. The report offers three reasons for this difference: (1) due to the one-child policy, this generation of Chinese benefit as the only child receiving parental financial support; (2) they are less inclined to purchase a home; and (3) they are optimistic about the future. This trend may not continue, especially considering the mounting debt China’s Gen-Z faces. Though the report shows that they’re rational shoppers compared to their predecessors, Chinese Gen-Zs value rank “quality” first when they shop for clothing. And they stand out in their desire to purchase products to display their uniqueness, and they tend to seek out one-off products and be willing to spend more when something is a limited-edition. Compared to millennials, Gen-Z is more interested in experiences than products, and the report shows that this is one of the larger differences between millennials and Gen-Zs in China. Therefore, creating unique experiences could be much more attractive to Gen-Zs than to millennials. The report found that social issues like human rights and protecting the environment are very important to Gen-Zs in China. 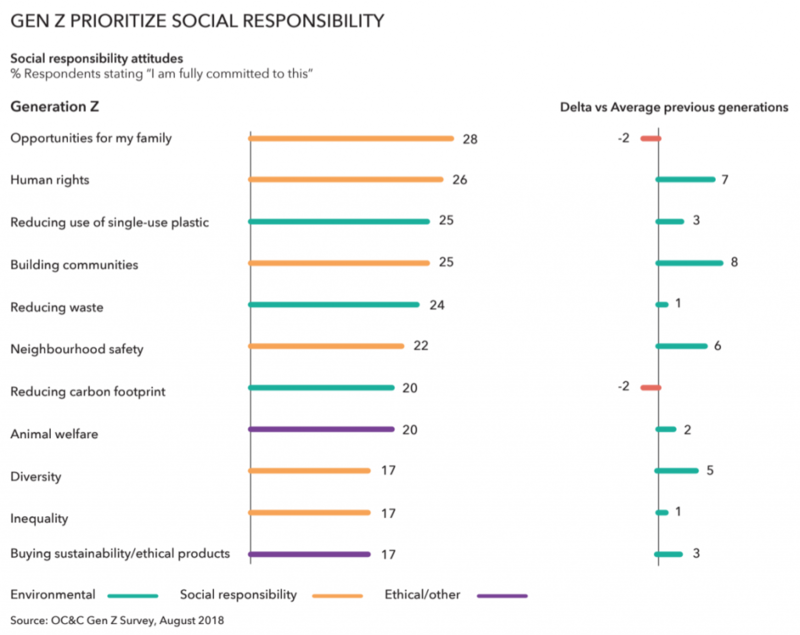 While Gen-Zs in the U.S. are more committed to solving diversity issues (they are the most racially and ethnically diverse generation in that country), they rarely take action in addressing those issues, and they’re less likely to prefer reusable products, preferring to chase after the latest trends and buy in excess.